Don’t hire just anyone to complete your roofing installation in Barrie, ON. With over 50 years in the roofing industry, there are several reasons why our team at Slippery Slope Roofing will be your choice for your roofing installation project. We believe in making our customers feel special by working on one project at a time and providing you with the best roofing experience possible. Focusing Our Attention on One Job Only: Yours. We don’t juggle three or four jobs at once. During your roofing installation, we give you our full attention. Using High Quality Materials. We want to ensure your roof will be functional and durable for many years. 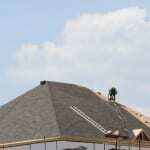 Using high-quality materials will prevent you from needing roofing repairs too soon. Experience and Trust. We have over 50 years of experience in the business, are fully insured with the WSIB, and accredited by the Better Business Bureau. That makes us a business you can count on! Surveys and Interviews. We will fully survey your property and take the time to sit down with you and discuss what your needs and wants are for your roofing installation. It’s important for us to determine what your needs are and make the vision in your head a reality. After all, your satisfaction is just as important as your new roof! If you are in the Barrie, ON area and you need help with your roofing installation project, or have questions about the process, don’t hire just anyone. Call us today!